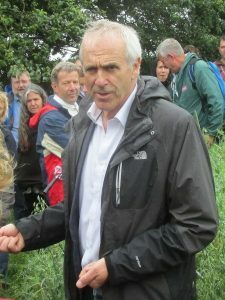 I received a very welcome email from Patrick Holden the CEO of the sustainable food trust, inviting me to a meeting at the Royal Highgrove House, and a tour of the Royal Duchy Organic Farms and Orchards. The request was instigated by David Wilson, the overall manager of the Royal Duchy Farms , both Patrick and David are close associates of Prince Charles. Prince Charles is one of the few public figures that is prepared to stick his neck out and oppose the GMO and Chemical Industries, that are contributing to chronic disease and the destruction of our environment and planet. 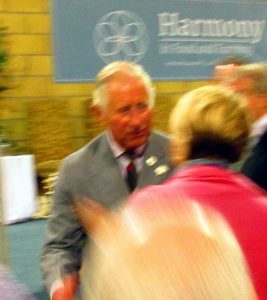 The Prince had already given a wonderful speech in Llandovery, based on his book Harmony a new way of looking at the world. 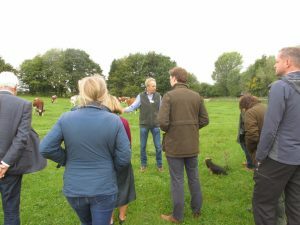 Eighteen others were invited including Scientists from Cornel University, representatives of the BBC, British Parliament, DEFRA, National Trust, Craig Sams, Soil Scientists, Biologists and Sustainable Organic Growers. Each individual was asked to offer their knowledge on ways to reduce climate change, ways to reverse the continues collapse of our biodiversity and ecosystems and ways to reduce the massive increase in chronic disease from the toxins in our food and water. Some of the interaction was quite heated as all sides and opinions were up for discussion, however the outcome was incredibly positive and I found the experience uplifting and enlightening and a great privilege to work with some of the best in their field. The meeting started at 9 0clock with a coffee working breakfast and continued all day with a break for lunch at midday in Highgrove. The tour of the Farm and Gardens was exciting and refreshing and it was a nice surprise to see a statue of Patrick Holden amongst the statues of past Kings & Queens, in the Highgrove Gardens. The meeting was a wonderful collaboration of like minded people and when one considers the work and dedication of these great people like Patrick Holden and David Wilson and the others at this Highgrove gathering, it then promotes this great sense of hope for our planet, our children and humanity at large. It has been suggested that the BBC will produce a program based on this meeting at Highgrove House, but I for one am eternally grateful for this invitation and for the recognition of our important work at The Organic Institution here in Ireland.